Following the recent update on the programme to replace setts on Brighton Place Portobello Community Council have further information on the proposed bus diversion routes. These will see Portobello High Street without the service of the 21, 42 and 49 routes. 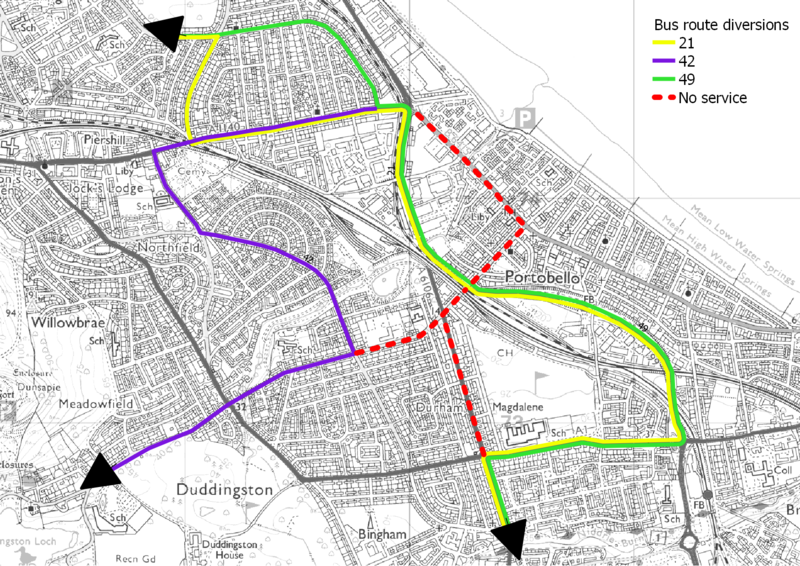 The 69 route, which is intended to get people to Portobello High Street and is funded by Edinburgh Council, will also be diverted. 69: Portobello – Willowbrae: diversion not finalised. May divert along Sir Harry Lauder Rd, turning around at Fishwives Causeway. “This is not ideal as the main purpose of the route (which is supported by CEC) is to get people to the shops in Portobello – we might try and find enough time in the route to go the length of Portobello High St and turn at Pittville Street”. The other Lothian and East Coast Buses services will operate as normal. No start date is yet scheduled for these works. They are expected to start at the end of July/start of August and last for 60 weeks.